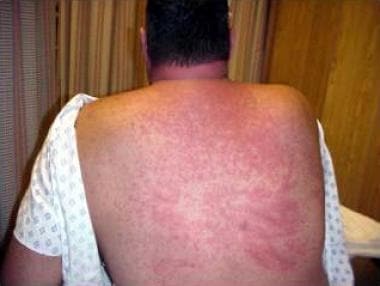 Toxic epidermal necrolysis (TEN) is a potentially life-threatening dermatologic disorder characterized by widespread erythema, necrosis, and bullous detachment of the epidermis and mucous membranes, resulting in exfoliation and possible sepsis and/or death (see the image below). Mucous membrane involvement can result in gastrointestinal hemorrhage, respiratory failure, ocular abnormalities, and genitourinary complications. Diffuse maculopapular rash in toxic epidermal necrolysis (TEN). TEN is most commonly drug induced. However, the disorder has other potential etiologies, including infection, malignancy, and vaccinations (see Etiology). TEN is idiosyncratic, and its occurrence is not easily predicted. Some authors believe that Stevens-Johnson syndrome (SJS; also known as erythema multiforme major) is a manifestation of the same process involved in TEN, with the latter involving more extensive necrotic epidermal detachment. TEN involves more than 30% of the body surface, whereas SJS involves less than 10% (see Differentials). TEN with spots is defined as widespread, irregularly shaped erythematous or purpuric macules with blistering that occurs on all or part of the macule. Blisters become more confluent and result in detachment of the epidermis and erosions on greater than 30% of the body surface area. Mucosal surfaces are usually involved. TEN without spots is defined as widespread, large areas of erythema with no discrete lesions. Epidermal detachment is greater than 10% of the body surface area. Mucosal surfaces are usually involved. Overlap Stevens-Johnson syndrome and TEN (SJS-TEN) is characterized by widespread, irregularly shaped erythematous or purpuric macules with blistering that occurs on all or part of the macule. Blisters become confluent and result in detachment of the epidermis and erosions on 10-29% of the body surface area. TEN is a clinical diagnosis, confirmed by histopathologic analysis of lesional skin (see Clinical and Workup). The mainstay of treatment is supportive care until the epithelium regenerates. Early transfer of patients to a burn or intensive care unit has been shown to reduce the risk of infection, mortality rate, and length of hospitalization (see Treatment). Lyell later reclassified the conditions of 2 of his patients as having staphylococcal scalded skin syndrome,  which is due to Staphylococcus aureus infection rather than to a probable drug hypersensitivity-type reaction. Histopathologic analysis of the skin remains the main tool for discrimination between the two conditions. Patients who have had TEN must be counseled regarding the likely causative medication or agent, and they must be advised to avoid these medications and those of the same or similar classes in the future. Cross-reactivity may occur with agents that chemically resemble the causative agent. Patients must call a pharmacist whenever they start a new prescription. Genetic factors are suspected in drug-induced blistering disorders, and blood relatives of the patient also should not use the suspected drug. For patient education information, see the Skin, Hair, and Nails Center, as well as Life-Threatening Skin Rashes. The pathophysiology of TEN has not been fully elucidated; however, various theories have received wide acceptance. TEN is believed to be an immune-related cytotoxic reaction aimed at destroying keratinocytes that express a foreign antigen. TEN mimics a hypersensitivity reaction, with its characteristic delayed reaction to an initial exposure and an increasingly rapid reaction with repeated exposure. Precisely how the inciting agent triggers the proposed pathways is yet to be elucidated. TEN in patients taking anticonvulsants has most often been reported within 2 months of starting the drug. However, some cases associated with long-term use have been reported. With allopurinol, risk is not constant over time. Patients have a 5.5 relative risk. However, during the first 2 months of therapy, the relative risk is 52, and the long-term therapy risk is 0.5. No laboratory test is able to confirm a specific drug etiology. A causal link is suggested when TEN occurs during the first 4 weeks of medication therapy, usually between 1 and 3 weeks. Drugs with longer half-lives and those with circulating active metabolites may result in more fulminant disease. Infectious agents (ie, Mycoplasma pneumoniae, herpes virus, hepatitis A), immunizations, and bone marrow or solid organ transplantation have also been associated with TEN. Worldwide, the average annual incidence of TEN is 0.4-1.3 cases per million population. In 1992, the cumulative incidence of TEN and SJS in Germany was 1.9 cases per million population. A French survey of dermatologists and health care facilities reported an annual incidence of 1 case per million population. TEN may occur in all age groups; however, the mean age of patients with TEN is reported to be between 46 and 63 years. Infection is more commonly implicated as an etiology in children, whereas medication exposure is more common in adults. Elderly persons may be at greater risk because of their tendency to use multiple medications. The estimated mortality associated with TEN varies widely in different reports, from 10-70%. Outcome depends in part on the quality of care and the rapidity with which treatment is initiated. Septicemia and multisystem organ failure are the primary causes of death. Epithelial loss results in vulnerability to bacterial and fungal infections. Sloughing of stratified epithelium of mucosal membranes can result in GI hemorrhage, respiratory failure, ocular abnormalities, and genitourinary lesions. Significant fluid loss from extensive skin exfoliation and an inability to tolerate oral intake can lead to hypovolemia, acute tubular necrosis, and shock. Age, extent of epidermal involvement, and serum urea level are said to be the most important prognostic factors in TEN. Mortality rates in children are much lower than in adults. Elderly patients have a poor prognosis. Major sequelae are generally limited to the affected organ systems (ie, the skin and mucosal membranes). A study by Power and colleagues found that 50% of patients with TEN developed ocular complications. Patients treated with steroids fared no better than those treated without steroids. Therefore, TEN remains a common cause of visual loss in a significant number of patients. Ultimately, 5-9% of patients can become blind as a result of some of these complications. Bastuji-Garin S, Rzany B, Stern RS, Shear NH, Naldi L, Roujeau JC. Clinical classification of cases of toxic epidermal necrolysis, Stevens-Johnson syndrome, and erythema multiforme. Arch Dermatol. 1993 Jan. 129(1):92-6. [Medline]. LYELL A. Toxic epidermal necrolysis: an eruption resembling scalding of the skin. Br J Dermatol. 1956 Nov. 68(11):355-61. [Medline]. LANG R, WALKER J. An unusual bullous eruption. S Afr Med J. 1956 Feb 4. 30(5):97-8. [Medline]. Lyell A. Toxic epidermal necrolysis (the scalded skin syndrome): a reappraisal. Br J Dermatol. 1979 Jan. 100(1):69-86. [Medline]. Pereira FA, Mudgil AV, Rosmarin DM. Toxic epidermal necrolysis. J Am Acad Dermatol. 2007 Feb. 56(2):181-200. [Medline]. Nagy N, McGrath JA. Blistering skin diseases: a bridge between dermatopathology and molecular biology. Histopathology. 2010 Jan. 56(1):91-9. [Medline]. Abe R, Shimizu T, Shibaki A, Nakamura H, Watanabe H, Shimizu H. Toxic epidermal necrolysis and Stevens-Johnson syndrome are induced by soluble Fas ligand. Am J Pathol. 2003 May. 162(5):1515-20. [Medline]. [Full Text]. Posadas SJ, Padial A, Torres MJ, Mayorga C, Leyva L, Sanchez E, et al. Delayed reactions to drugs show levels of perforin, granzyme B, and Fas-L to be related to disease severity. J Allergy Clin Immunol. 2002 Jan. 109(1):155-61. [Medline]. Paul C, Wolkenstein P, Adle H, Wechsler J, Garchon HJ, Revuz J, et al. Apoptosis as a mechanism of keratinocyte death in toxic epidermal necrolysis. Br J Dermatol. 1996 Apr. 134(4):710-4. [Medline]. Nassif A, Moslehi H, Le Gouvello S, Bagot M, Lyonnet L, Michel L, et al. Evaluation of the potential role of cytokines in toxic epidermal necrolysis. J Invest Dermatol. 2004 Nov. 123(5):850-5. [Medline]. Chung WH, Hung SI, Yang JY, Su SC, Huang SP, Wei CY, et al. Granulysin is a key mediator for disseminated keratinocyte death in Stevens-Johnson syndrome and toxic epidermal necrolysis. Nat Med. 2008 Dec. 14(12):1343-50. [Medline]. Roujeau JC, Kelly JP, Naldi L, Rzany B, Stern RS, Anderson T, et al. Medication use and the risk of Stevens-Johnson syndrome or toxic epidermal necrolysis. N Engl J Med. 1995 Dec 14. 333(24):1600-7. [Medline]. Das S, Roy AK, Biswas I. A six-month prospective study to find out the treatment outcome, prognosis and offending drugs in toxic epidermal necrolysis from an urban institution in kolkata. Indian J Dermatol. 2013 May. 58(3):191-3. [Medline]. [Full Text]. Thammakumpee J, Yongsiri S. Characteristics of toxic epidermal necrolysis and stevens-johnson syndrome: a 5-year retrospective study. J Med Assoc Thai. 2013 Apr. 96(4):399-406. [Medline]. Moshfeghi M, Mandler HD. Ciprofloxacin-induced toxic epidermal necrolysis. Ann Pharmacother. 1993 Dec. 27(12):1467-9. [Medline]. Ernst ME, Ernst EJ, Klepser ME. Levofloxacin and trovafloxacin: the next generation of fluoroquinolones?. Am J Health Syst Pharm. 1997 Nov 15. 54(22):2569-84. [Medline]. Creamer JD, Whittaker SJ, Kerr-Muir M, Smith NP. Phenytoin-induced toxic epidermal necrolysis: a case report. Clin Exp Dermatol. 1996 Mar. 21(2):116-20. [Medline]. Lissia M, Mulas P, Bulla A, Rubino C. Toxic epidermal necrolysis (Lyell's disease). Burns. 2010 Mar. 36(2):152-63. [Medline]. Abood GJ, Nickoloff BJ, Gamelli RL. Treatment strategies in toxic epidermal necrolysis syndrome: where are we at?. J Burn Care Res. 2008 Jan-Feb. 29(1):269-76. [Medline]. Chung WH, Hung SI, Hong HS, Hsih MS, Yang LC, Ho HC, et al. Medical genetics: a marker for Stevens-Johnson syndrome. Nature. 2004 Apr 1. 428(6982):486. [Medline]. Ferrell PB Jr, McLeod HL. Carbamazepine, HLA-B*1502 and risk of Stevens-Johnson syndrome and toxic epidermal necrolysis: US FDA recommendations. Pharmacogenomics. 2008 Oct. 9(10):1543-6. [Medline]. [Full Text]. Struck MF, Hilbert P, Mockenhaupt M, Reichelt B, Steen M. Severe cutaneous adverse reactions: emergency approach to non-burn epidermolytic syndromes. Intensive Care Med. 2010 Jan. 36(1):22-32. [Medline]. Revuz J, Roujeau JC, Guillaume JC, Penso D, Touraine R. Treatment of toxic epidermal necrolysis. Créteil's experience. Arch Dermatol. 1987 Sep. 123(9):1156-8. [Medline]. Koh MJ, Tay YK. An update on Stevens-Johnson syndrome and toxic epidermal necrolysis in children. Curr Opin Pediatr. 2009 Aug. 21(4):505-10. [Medline]. Bastuji-Garin S, Fouchard N, Bertocchi M, Roujeau JC, Revuz J, Wolkenstein P. SCORTEN: a severity-of-illness score for toxic epidermal necrolysis. J Invest Dermatol. 2000 Aug. 115(2):149-53. [Medline]. Magina S, Lisboa C, Leal V, Palmares J, Mesquita-Guimarães J. Dermatological and ophthalmological sequels in toxic epidermal necrolysis. Dermatology. 2003. 207(1):33-6. [Medline]. Power WJ, Ghoraishi M, Merayo-Lloves J, Neves RA, Foster CS. Analysis of the acute ophthalmic manifestations of the erythema multiforme/Stevens-Johnson syndrome/toxic epidermal necrolysis disease spectrum. Ophthalmology. 1995 Nov. 102(11):1669-76. [Medline]. Barrera JE, Meyers AD, Hartford EC. Hypopharyngeal stenosis and dysphagia complicating toxic epidermal necrolysis. Arch Otolaryngol Head Neck Surg. 1998 Dec. 124(12):1375-6. [Medline]. Bachot N, Roujeau JC. Differential diagnosis of severe cutaneous drug eruptions. Am J Clin Dermatol. 2003. 4(8):561-72. [Medline]. Avakian R, Flowers FP, Araujo OE, Ramos-Caro FA. Toxic epidermal necrolysis: a review. J Am Acad Dermatol. 1991 Jul. 25(1 Pt 1):69-79. [Medline]. Fromowitz JS, Ramos-Caro FA, Flowers FP. Practical guidelines for the management of toxic epidermal necrolysis and Stevens-Johnson syndrome. Int J Dermatol. 2007 Oct. 46(10):1092-4. [Medline]. Endorf FW, Cancio LC, Gibran NS. Toxic epidermal necrolysis clinical guidelines. J Burn Care Res. 2008 Sep-Oct. 29(5):706-12. [Medline]. Palmieri TL, Greenhalgh DG, Saffle JR, Spence RJ, Peck MD, Jeng JC, et al. A multicenter review of toxic epidermal necrolysis treated in U.S. burn centers at the end of the twentieth century. J Burn Care Rehabil. 2002 Mar-Apr. 23(2):87-96. [Medline]. Ririe MR, Blaylock RC, Morris SE, Jung JY. Intravenous immune globulin therapy for Stevens-Johnson syndrome/toxic epidermal necrolysis complicated by hemolysis leading to pigment nephropathy and hemodialysis. J Am Acad Dermatol. 2013 May 11. [Medline]. Chaidemenos GC, Chrysomallis F, Sombolos K, Mourellou O, Ioannides D, Papakonstantinou M. Plasmapheresis in toxic epidermal necrolysis. Int J Dermatol. 1997 Mar. 36(3):218-21. [Medline]. Picard E, Gillis D, Klapholz L, Schreiber L, Engelhard D. Toxic epidermal necrolysis associated with Klebsiella pneumoniae sepsis. Pediatr Dermatol. 1994 Dec. 11(4):331-4. [Medline]. Dodiuk-Gad RP, Chung WH, Valeyrie-Allanore L, Shear NH. Stevens-Johnson Syndrome and Toxic Epidermal Necrolysis: An Update. Am J Clin Dermatol. 2015 Oct 19. [Medline]. Dodiuk-Gad RP, Olteanu C, Jeschke MG, Cartotto R, Fish J, Shear NH. Treatment of toxic epidermal necrolysis in North America. J Am Acad Dermatol. 2015 Nov. 73 (5):876-877.e2. [Medline]. Toxic epidermal necrolysis (TEN) ulcer in great toe (initial infection). Hemorrhagic crusting of mucous membranes in toxic epidermal necrolysis (TEN). Maculopapular rash in toxic epidermal necrolysis (TEN). Toxic epidermal necrolysis (TEN) blister on the index finger. Epidermal sloughing in toxic epidermal necrolysis (TEN).